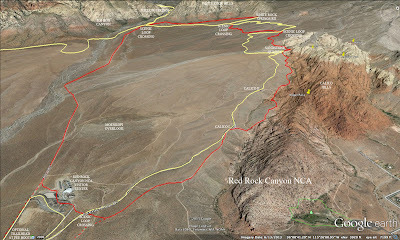 The Grand Circle Loop of Red Rock Canyon NCA is almost 12 miles in length. The trail is used quite often by trail runners. And, today, there were thirteen club hikers who took on the distance hike with fervor! Out of the thirteen hikers, there were 3 or 4 who had not hiked the complete loop previously. They were introduced to the hike in the best way to do the Grand Circle ... fast! From the beginning, there were two or three hikers that charged out front and set the moving pace of around 3 miles per hour. Our loop hike began at the fee booth parking lot where we would be able to accomplish the entire 12 miles. We walked up the paved road below the Visitor Center and connected with the trail that used to be an old gravel road that ran up to the White Rock Hills and beyond. 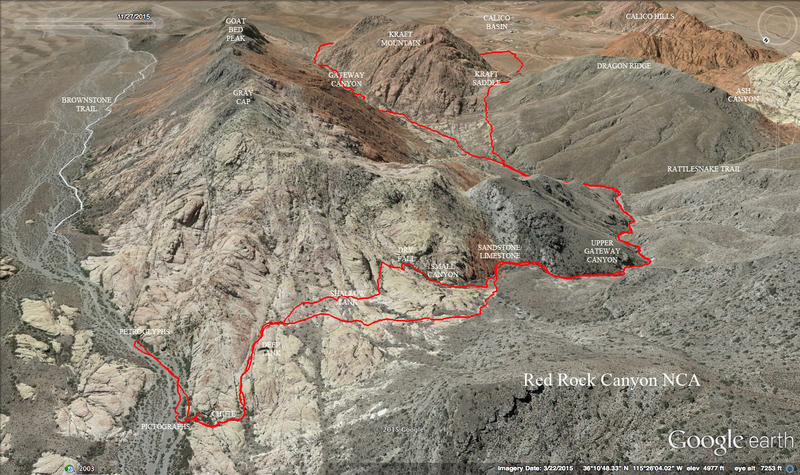 The road runs along a ridge above the Red Rock Wash. Distant views of Turtlehead and closer views of the escarpment were a constant for the first 4 miles as the White Rock Hills neared. The morning was very cold but, thank goodness, there was very little wind to go with it. Therefore, we warmed up and began shedding layers about half way up to the first Scenic Loop crossing. Not far after the paved road, we junctioned with the White Rock Hills Loop trail and turned right. This section of the circle dips down into a brushy wash and out the other side. It is one of the more interesting parts of the hike. At the other side of the dip, we came to the old road again. This is the dreaded section of the hike because it is a long continuous upclimb to the high point of the hike while working on the sixth mile. The thirteen hikers were not able to stay together but periodical rests gathered us back into the fold. At the top of this long hill, we took our snack break at the White Rock Springs trailhead, pit toilet provided. Sufficient time was taken then we were on our way again. We began the "downhill" half of the hike by descending the half mile of gravel road built to approach the trailhead. At the bottom of the hill, we crossed the Scenic Loop again and continued down into the desert. The group stayed together much better during the next three miles of undulations. By this time, the whole group was into the fast pace. We were awake! And, we crossed the Scenic Loop a third time. The first half of the Grand Circle done in a clockwise direction is not very interesting even though the constant view is quite beautiful. That said, the second half of the Grand Circle done in a clockwise direction is mucho fabuloso! The closer we got to the Calico Hills, the more photos the writer wanted to take. We entered a wash not far from the cracked dino egg rock landmark and crunched down the gravel for a short way. From there, we circled around the end of a ridge and dipped down right at a sandstone hill. Up and over the little hill and we dropped down into the busy Sandstone Quarry area. The parking lot was filled past the brim and we stopped for a short visit to the pit toilet. Now, we were really moving. The group started to spread out again between Sandstone Quarry, Calico II and Calico I which was designated as our next gathering. This side of the park was crawling with hikers, tourists and scramblers. The sandstone hills were beautiful in the low winter sun. We seemed to hike faster as we trod along between the sandstone and the Scenic Loop above. Finally, after a rest stop at the Calico I overlook, we started down the rocky home stretch back to the fee booth parking lot. As we hiked the last few feet, smiles could be seen on everyone's faces. What a workout! Fantastic! Now, where's the glass of wine and hot bath! Love it! Brownstone Canyon is one of Red Rock Canyon NCA's treasures ... one of many. It is in this canyon that a beautiful well preserved wall of pictographs and four large panels of petroglyphs painted and drawn by early native Americans can be found. 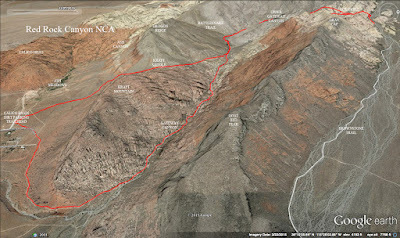 The hike to the canyon is as big an attraction as are the early writings. Some of the conservation area's most beautiful scenery can be viewed along the route. Knowing that the day after Thanksgiving is the park's most busy day of the year, we all arrived early at the Calico Basin dirt parking lot at the end of Sandstone Drive. When we began our hike at 8am, there were only about 5 other cars in the parking lot. Before we began, we had to turn away two hikers who wanted to be on this hike. Just a reminder, we have a difficult time judging the people that come to us for a moderately strenuous to strenuous hike if we don't know them. We have learned that it is better to be safe than sorry. Eleven advanced club hikers left from the cars to climb 5 Stop Hill on a chilly morning. Exactly as predicted, the harsh wind subsided right around 8am so we warmed up quickly on the steep climb. One by one, we arrived at Kraft Saddle to catch our early morning breath. From there, we followed the trail down into Gateway Canyon. The next part was a slog up through the gravel of Gateway until we reached the junction with Rattlesnake Trail. The slog was tolerated since we all knew that the scrambling that we were looking forward to was nigh. Finally, we made it to the big rocks and boulders. Upper Gateway Canyon is made completely of limestone. The rocks are strewn in the canyon from beginning to end with several big dry falls thrown in among them. Each dry fall is well learned by most of the hikers today. 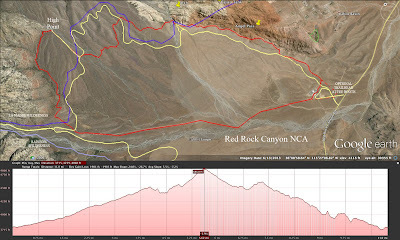 Upper Gateway Canyon changes from year to year but only in small increments. Even powerful water has a hard time moving many of the canyon's big boulders. We passed the dry falls one by one. The fun we were having showed on our faces. We moved quickly up testing our skills and strength. About two-thirds of the way up, we took a time out for removing a large agave splinter from a hiker's finger. It had even stuck her through her glove! When the surgery was complete, we continued up through more boulders and dry falls to where the limestone met colorful sandstone. We took a short break as we looked around at the gorgeous views. Like the invention of Kodachrome, the grays turned into red, white and green. Straight up the sandstone or up to the right are routes that take hikers to a little peak called Gray Cap. 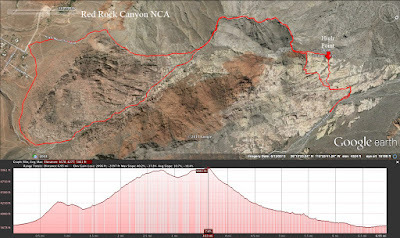 Today's route to Brownstone Canyon turned up to the left. Then, we soon took a right into a small side canyon where we would continue a good scramble up to a large and beautiful dry fall on the left side. 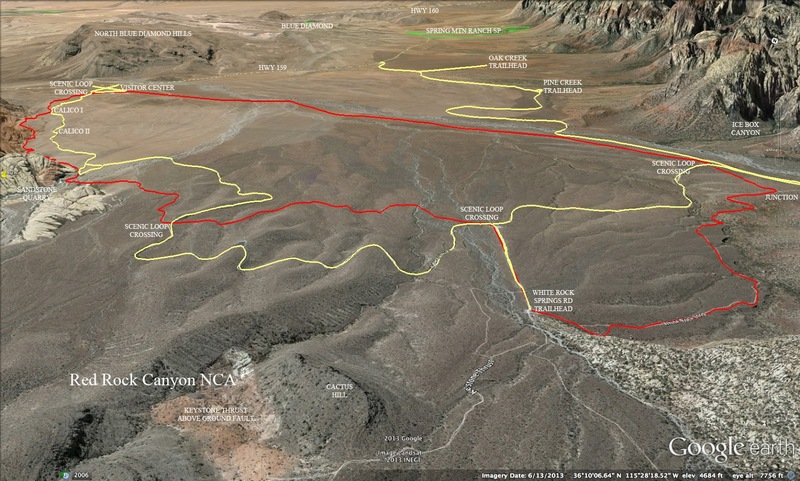 One of today's hikers showed us a new route up onto the plateau from here and it was a good one. As we scrambled up across the large dry fall, we passed two very deep small tanks filled with clear water. After making our way through a wash crevice, we arrived on the plateau and found a large shallow tank filled with partially frozen water. A photo or two and we were on our way again to find the deep hidden tank landmark alley way. The dome of rock rose not far from us and we crossed the sandstone. The bottom of the deep tank was only one-third covered with water. 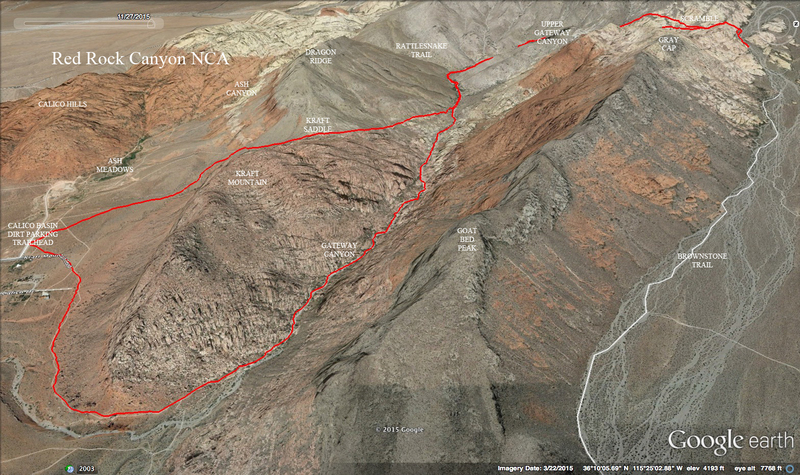 We continued following the sandstone fin down to the descent chute that would take us into Brownstone Canyon. The chute is completely negotiable but it may not seem that way at first glance. Again, today's hikers either knew what to do or were shown how to descend by the others. 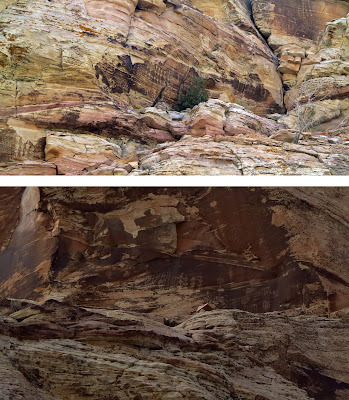 At the bottom of the chute, we stepped along the contour of a sandstone wall and dropped down to the pictograph area. There were a few hikers, today, that had not seen the paintings before and were impressed with their clarity. 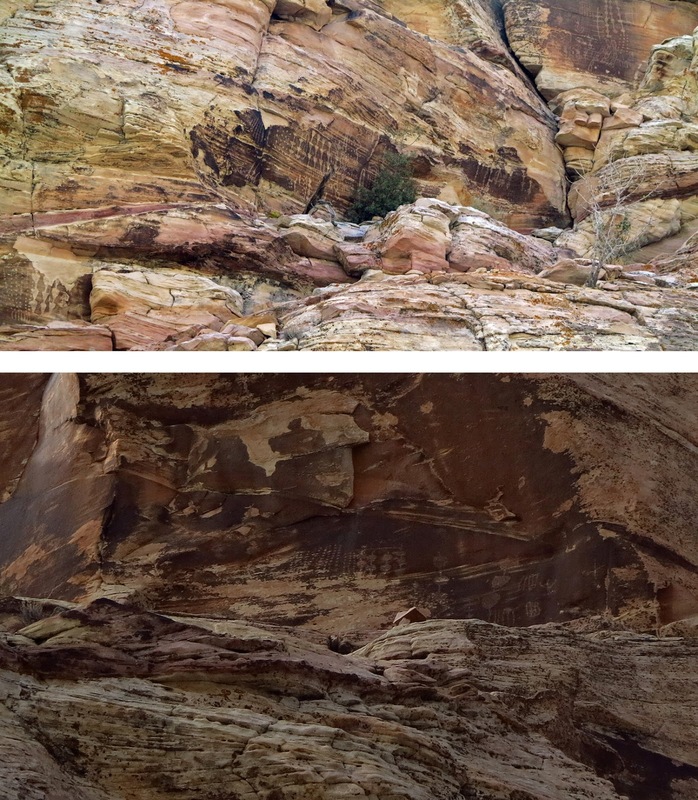 We studied the wall then a small contingency went down the wash, Brownstone Trail, to see the three panels of petroglyphs high up on the rocks to the right. 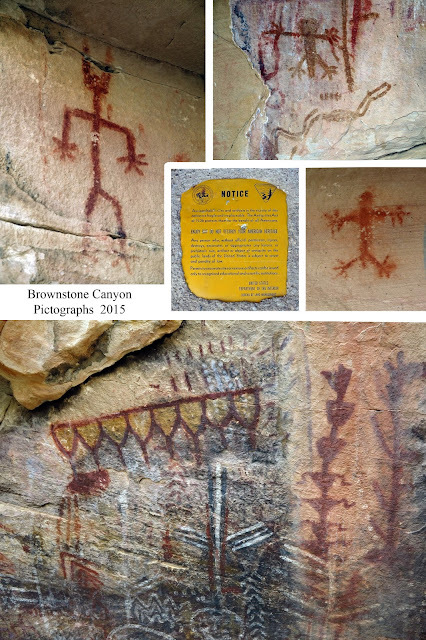 On the way back, we finally spotted a fourth panel of petroglyphs that had alluded us before. All of these writings were very "busy" as you can see in one of the photos below. On our return to the pictograph area, we found a rock in the sun and took our snack break. Only one hiker had a turkey sandwich! Up the wash approximately 0.8 miles, there is an old dam used for watering cattle. Down the wash approximately 0.25 miles are the petroglyphs and a view of the city. So after our break, we climbed back up the chute and continued up to the deep tank alley. Taking a different route, we scrambled over the plateau to the top of the trail that we had turned off of to go into the small canyon. Baby steps took us down the steep sandstone to the top of Upper Gateway Canyon. A small break here and we were off! Down through the maze of boulders! 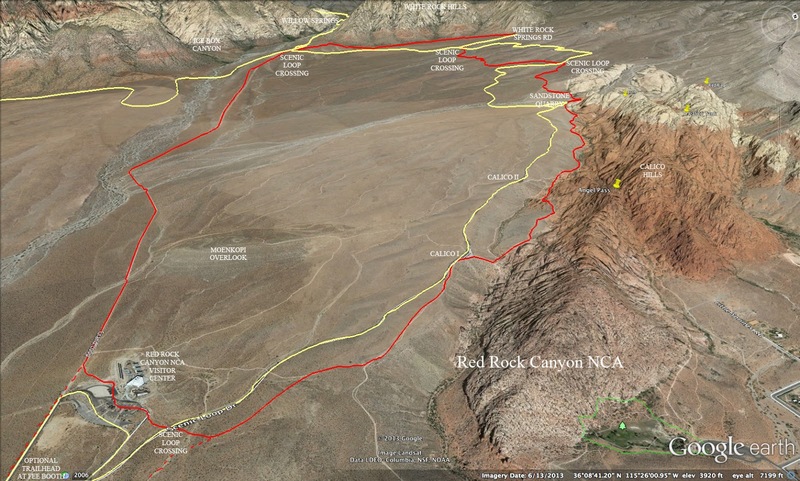 The next stop would be the junction of Rattlesnake Canyon. On our way, we took both of the side trails that led around two of the high dry falls that were more fun to climb than to descend. The sun hid behind the clouds occasionally and, only then, were we cold. Otherwise, the 40ish degree weather was perfect for a great workout outside. We stopped for a short break at Rattlesnake Trail then continued down the gravel section of Gateway Canyon. Much easier going down the gravel! 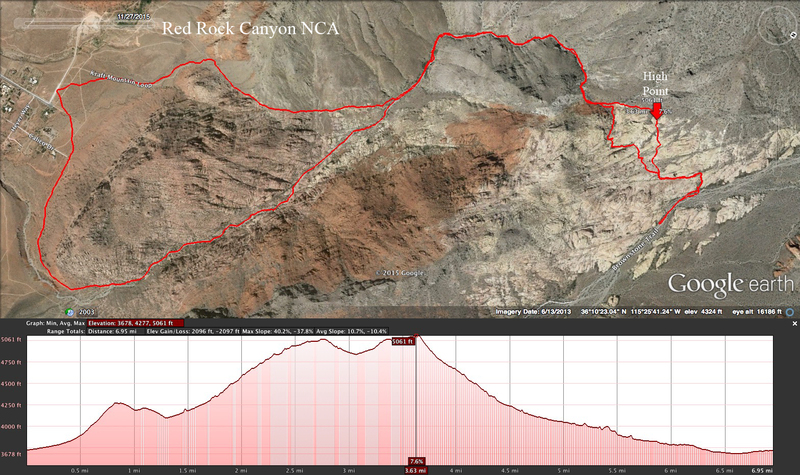 So the return route, today, included a descent down through Lower Gateway Canyon. This part of the canyon changes greatly from year to year; perhaps because of the fact that there is more small gravel in this half of the canyon. The sides of the canyon are lined with calico sandstone. There are stripes and dots and reds and whites. The semi-scramble down flowed easy as we began to see other hikers and rock climbers coming up. There was a large group of rock climbers up on the walls below Goat Bed Peak and that should have clued us into what was coming next. When we started up the trail that circles around the east end of Kraft Mountain, we realized that all the climbing boulders were crawling with rock climbers. Large groups of climbers crowded around each of the stations and there were even groups around boulders that we had not seen climbers on before. And, as we hiked around the trail back to the cars, the rock climbers carrying crash pads on their backs just kept coming and kept coming. It was just after noon by this time so the busy day in the park had materialized. Back at the cars, the number of cars parked ... well, everywhere ... was unbelievable! Somehow, we each extricated our car from our space after having had an excellent day on the trails!